(Photo courtesy of UDOT) This no-driver, no-steering wheel shuttle will be used in a year of demonstrations and research by UDOT and UTA. Imagine an automated public street shuttle — without a driver or steering wheel — that can transport eight to 16 people safely to a nearby transit stop, doctor office or store. It’d be especially nice for kids, the disabled or others without a driver license. It’s coming to Utah. Right now. The pilot project by the Utah Department of Transportation and the Utah Transit Authority will be an early ambassador both to demonstrate and figure out what may be possible with autonomous vehicles in the near future. The shuttle is scheduled to debut next month at the Utah Capitol for the Legislature, and then go on a yearlong tour around the state to let residents and transportation officials kick the tires and experiment with what it may do in a variety of scenarios, locations and seasons. “Seventy percent of Americans believe that autonomous vehicles are inevitable and will be a big part of our transportation landscape in the next 15 years,” said Lisa Miller, outreach and growth manager for UDOT’s transportation technology group. But only “40 percent of the traveling public thinks autonomous vehicles are safe,” she added. So part of the pilot project will be to do some public relations to show what autonomous vehicles can do safely now, and what they may do in the future. As for the sister agency, UTA, “it is about testing the technology so we can understand how it performs and how we can incorporate it into the transit system in the future — and how it can fill gaps that we have,” said Jaron Robertson, UTA program manager for innovative mobility solutions. Those gaps may include helping people travel the first mile or last mile from transit stops to their work or home. Or autonomous shuttles may better handle transit in some neighborhoods than a fixed bus route. The two agencies are spending a combined $600,000 for a year to bring in a shuttle from France-based EasyMile, and perform a variety of studies and demonstrations. First up will be a day or more at the Legislature, scheduled to begin Feb. 6, or “Transportation Day” there. The shuttle can seat eight people and has handholds to allow another seven or eight people to ride while standing. A host will ride along to ensure safety and answer questions. It will travel 15 mph. “Right now, it’s not allowed by law to be on any real roadway,” Miller said. So it initially will travel on sidewalks at the Capitol, perhaps from one side of the campus to the other. However, Rep. Robert Spendlove, R-Sandy, has introduced HB101, which could allow autonomous vehicles on state roads, and resolve legal problems over licensing and liability. 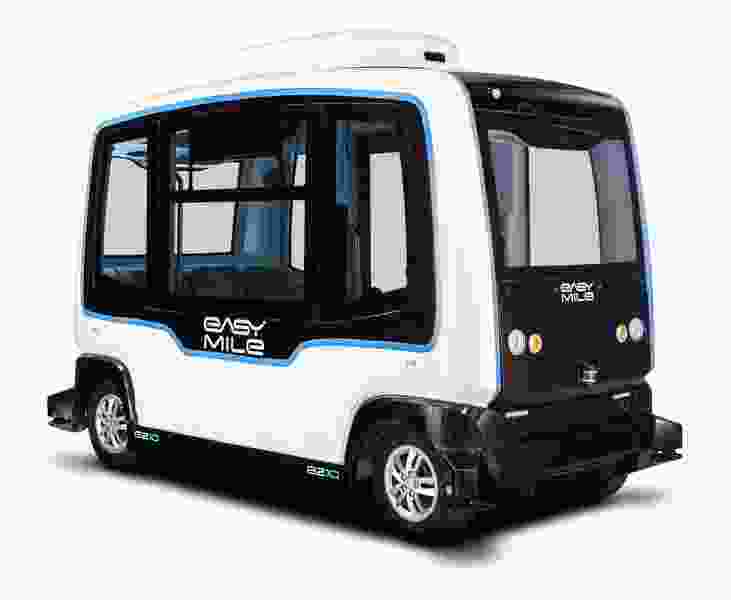 The new shuttle is capable only of following a predetermined route — called a level four of autonomy — but has technology to detect and avoid obstacles or pedestrians in the way. A level five of autonomy would be a vehicle that is capable of traveling anywhere without a driver. A level one or two includes vehicles with some autonomous features from cruise control to lane assist or automatic parallel parking. Miller and Robertson warn that those who try out the shuttle over the coming year — they will be invited to do at many yet-to-be-determined sites — may be a little underwhelmed. But they say it is exciting to consider the possibilities. For example, UDOT figures that autonomous vehicles could improve safety and reduce congestion. Unlike human drivers, they would always be focused on the road, Miller said, “and not talking on a cellphone or eating a hamburger." And fleets of autonomous vehicles communicating with one another and traffic signals, and with radarlike detection, could travel more compactly and efficiently — allowing roads to carry more vehicles more quickly. “I grew up in a small town in Wisconsin. When I was a kid, I wished I knew whether I could pass that slow-moving combine in front of me, and whether a car was coming in the other direction,” Miller said. Officials say the new pilot project is one of many innovations they are studying. For example, UDOT and UTA have been experimenting with a system on Redwood Road that allows traffic signals to sense when UTA buses there are behind schedule. They change the timing of lights to help them catch up. UTA is also looking at how rental scooters and bikes, ride-sharing companies and car sharing could help fill gaps in its system. “It’s important for us to be prepared as technology advances,” Robertson said.